In this last Monday's Read This F@!%ing Book post, I mentioned a novella in the Whyborne & Griffin series that crosses over with K. J. Charles's Simon Feximal stories. I loved that novella and it made me want to read more about Simon Feximal and Robert Caldwell's adventures with the occult. The novella is an older one and had listed a few short stories the author had written and posted to Smashwords. Much to my delight, I discovered that Charles had compiled those short stories and others into one volume earlier this year and was available as a Kindle book. Spoiler alert: I bought it and I loved the hell out of it! 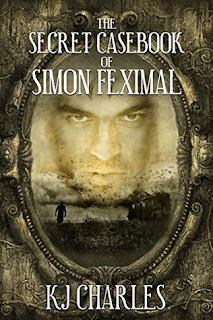 The Secret Casebook of Simon Feximal is really a collection of short stories chronicling how Simon and Robert's first meet and different key cases that they worked on in the early years of their acquaintance. Funny enough, their relationship starts out with Robert Caldwell having a ghost he can't ignore anymore when the walls start bleeding. He finds help in the form of one Simon Feximal, noted occultist with steel-colored hair. Robert finds himself almost instantly drawn to this serious man who smiles so rarely. This fascinating book is presented as the posthumous journal of a well-known popular writer in the Watson/Holmes dime novel mold. It starts as what appears to be two stand-alone short stories but then the storylines quickly become intertwined, much as do the lives of Robert and Simon. These tales are the stories that Robert could never tell in his writing of his Casebooks of Feximal the Ghost-Hunter novels because they chronicle the love story between him and Simon. If you've read K. J. Charles's A Charm of Magpies books, you know that she has a knack for writing a plausible image of queer life in Victorian London that's filled with the paranormal and the occult. Her characters have to deal with the dangers of a hostile social world that condemns two men for having a romantic relationship. She weaves that feeling of having to hide in with the fact that ghosts and the occult are accepted as normal parts of life in her novels. Simon and Robert have to deal with much of the same. What I loved is that even though them having to hide their relationship is part of the story, it's not the focus of the story. Simon and Robert’s world is full of fearsome things and the events of the stories are fascinating and intriguing at the same time but their developing love for each other and hope for a life together is what gets the spotlight. I loved this strange little collection of vignettes so much! I can't really go into detail about why I loved the ones I did the most because they are short stories and any talk of specifics would be spoilery. The romance is a lot sweeter than I thought it would be when we're first introduced to one Simon Feximal. Both Robert and Simon are complex characters who don't always act as we first predict. Because of that, these two sneakily found themselves a spot on my favorite OTPs list before I even realized that I shipped them together. 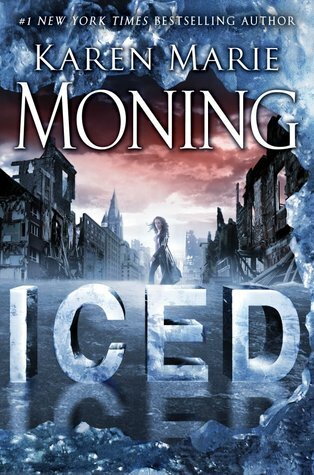 Just go read this book and come join me in happily shipping Simon and Robert together. Random Note: Charles introduces historical figures in the story who were celebrated in the world of the occult in the 1890s which reminds us that there has always been a human fascination with the world below.